Chilling Adventures of Sabrina season 1 episode 3 opens with Sabrina reeling from her encounter with the Dark Lord in the principal’s office in the previous episode. At Baxter High School, Roz wants to do a report on what she finds out is a banned book. WICCA investigates and discovers that a number of books disappeared in a “soft purge” a few years ago. The girls create an effort to get the PTA and school board to review the policy, but it will take three months before they hold a meeting. Roz reveals that she will be blind in three months. With Wardwell’s help, WICCA puts together a secret book club that exclusively deals with banned books that Wardwell has selected for each girl. Harvey wants to get a job drawing posters and working at the book store, but his father isn’t having it. 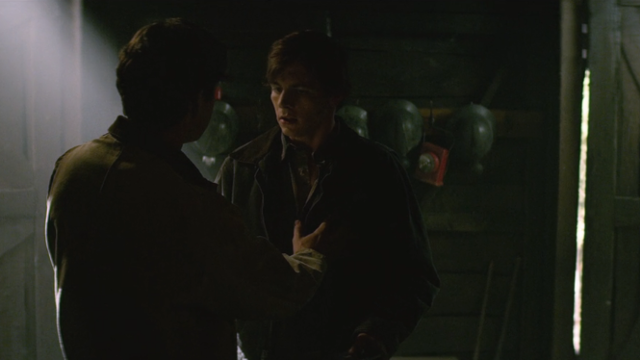 He wants Harvey to join him and Harvey’s older brother Tommy working in the mines. Harvey tells Sabrina that he can’t because when he was younger, Harvey was playing hide and seeking the mine when he met the Dark Lord. Harvey panics and wonders whether the Dark Lord is still down there waiting for him. Ambose has found Connor’s familiar, an iguana, on Connor’s casket. 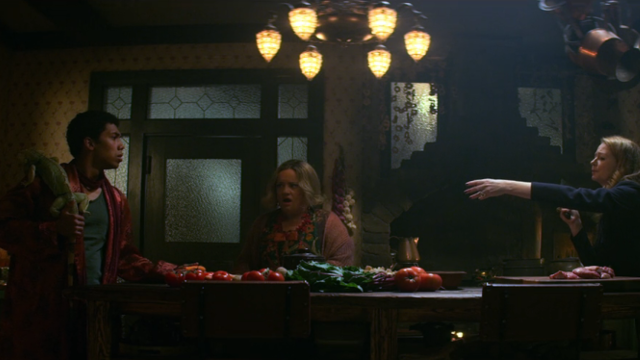 Aunt Zee tells Ambrose that a familiar can’t live without its witch or warlock. Ambrose tries, unsuccessfully, to get the familiar to talk to him and tell Ambrose what happened to Connor before the iguana dies. However, Ambrose might have another way in through Luke, a warlock that Connor dated a few times. Sabrina is summoned to the Infernal Court where she will be tried for breaking her promise to the Dark Lord. Under witch law, she is considered guilty unless proven innocent. Ambrose tells Sabrina that there might be one person who can help her. 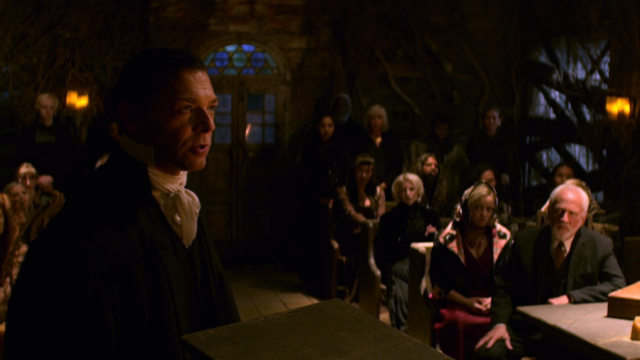 Sabrina seeks out the lawyer Daniel Webster, who specializes in occult law. Webster once made a deal with the devil and though he initially refuses to help Sabrina, comes out of retirement to take her case. In contention is how much Sabrina should be bound to witch law versus mortal law, since she is half of each. 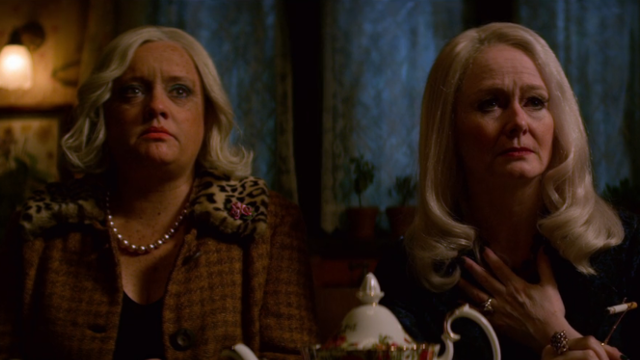 During the trial, it is revealed that three days after Sabrina’s birth, her father Edward signed away Sabrina’s soul to the Dark Lord in exchange for permission to marry Diana, Sabrina’s mother, with Aunt Zee serving as witness. With Sabrina about to face the humiliation of being strip searched in front of the entire coven for a witch’s mark, Aunt Hilda produces a final piece of evidence. When Sabrina was only two days old, Diana had Sabrina baptized in a Catholic church with Hilda serving as witness. With Sabrina’s baptism nullifying Edward’s agreement, the Dark Lord offers Sabrina a deal. She will be allowed to retain her mortal connections, but must also attend the Academy and learn to become a witch. By taking the deal, Sabrina’s punishment in the pit upon her death is revoked. Sabrina takes the deal, with Webster encouraging her to use the time at the Academy to learn everything she can about her adversary. Whenever the Dark Lord makes a deal, there is always a trick and always a cost. During the trial, aunts Hilda and Zee had their powers and youth stripped from them. Upon Sabrina taking the Dark Lord’s deal, the two have their powers and youth restored. But, for her role in Sabrina’s baptism, Hilda has been excommunicated from the Church of the Night. 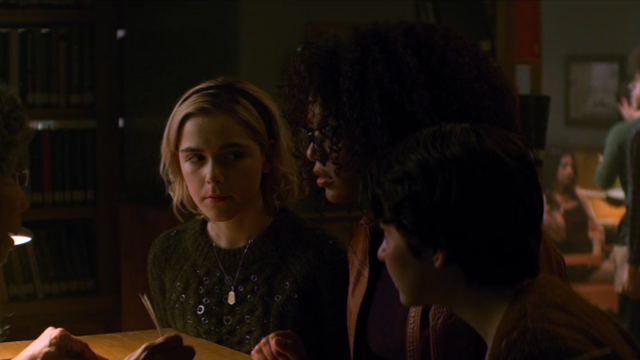 What did you think about Chilling Adventures of Sabrina season 1 episode 3? Let us know in the comments below!